Singles Knockout winner - Dave Perrett. Singles Knockout runner up - James Verrill. Doubles Knockout winners - Colin Stainthorpe & Adrian Kelly. Doubles Knockout runners up - Ben Laws & James Gilpin. Heaviest Fish out of competition - Mike Breckon - 8 lb 10 oz. Christmas match winner - Rob Allison - 6 lb 12 oz - 4 fish. Christmas match Heaviest Fish - Dave Hambley - 4 lb 14 oz. Greatest number of fish - Brian Harland - 78 fish. Heaviest Bag of Fish - Mike Vasey - 17 lb 04 oz ( 13th January 2010). 1st - Ryan Vasey - 8 lb 14 oz - fish. Junior Heaviest Fish - Ryan Vasey - 4 lb 01 oz. Junior Heaviest Bag - Ryan Vasey - 4 lb 13 oz. Total weight for the season - 1,076 lb 06 oz. Total Number of fish - 649. The first match of the season saw a good turn out of anglers fishing a low water match with swell in the water. Expectations were high but alas the season started as the last one finished with mostly Rocklings coming back to the scales. The winners of the first match both tied on 3 lb 04 oz were Brian Harland and Dave Smith. 1st = Brian Harland 2 fish Dave Smith 1 fish 3 lb 04 oz. 3rd Denis Thompson 3 lb 01 oz 3 fish. 4th = William Atkinson 4 fish, Rob Allison 3 fish 1 lb 10 oz. 12th = Bernard Vasey, Colin Stainthorpe, Jason Ebison 0 lb 06 oz 1 fish. The Whitby Sea Anglers turned out to fish an ebb tide with good sea running with colour in the water. Hopes were high for a good bag of fish or two but again these were dashed. Dave Perrett won the match with 3 fish for 5 lb 04 oz. Fishing a high water ebb match with calmer conditions Brian Harland won again with seven fish for 6 lb 06 oz. Whitby Sea Anglers turned out to fish a small flooding tide, strengthening NW wind and a growing sea not ideal conditions. Again Codlings were scarce on the Ground. But Adrian Kelly found a single fish to take the match with 3 lb 11 oz. Fishing a low water match, flat calm conditions & clear water prospects were not good considering recent matches with better conditions not producing many fish. No Codlings came back to the scales but new member J. Verrill won his first match with a fine Billet of 1 lb 12 oz. Fishing a large ebbing tide Whitby Sea Anglers had better weigh in than of late with the odd Codling now starting to show. Mike Vasey won his first match of the season with 3 fish for 5 lb 04 oz. Fishing an ebbing tide, with a heavy south easterly sea running and heavy rain. More Codlings were back at the scales but these were still patchy as some anglers failed to locate fish. Brain Harland was the man on form setting the target for the heaviest bag of the season so far with an excellent nine fish for 14 lb dead. Dave Perrett also set the target to beat for the heaviest fish with one of 5 lb 08 ½ oz. Turning out to fish a flooding tide to high water conditions were not good, sea calm and water starting to clear out. When conditions are like this Codlings are very scarce and most anglers target other species. This was the case for most of The Whitby Sea Anglers with mostly Billets, Eels, Rocklings and Bleggs coming back to the scales, only one Codling was weighed in. Mike Vasey continued his winning form with 5 fish for 4 lb 01 oz. With calm conditions still prevailing and anglers fishing a very small flooding tide catches were very poor. Only three people weighed in Dennis Thompson winning the match with six fish for 3 lb 12 oz. 2nd = James Verrill, Mike Vasey 1 lb 00 oz 1 fish. Fishing a low water match a dying south easterly sea and colour in the water prospects for a Codling were high. But the fish failed to show again with only three coming back to the scales. Andy Cass won his first match of the season finding two of these Codlings for 6 lb 10 oz one fish being 4 lb 13 oz the target for this month’s heaviest fish. Fishing an ebb tide with calm conditions not ideal for catching Codlings but again three fish came back to the scales. This time Dave Perrett won the match with a single fish of 3 lb 02 oz. Fishing a high water match and calm conditions Billets and Rocklings came back to the scales with the exception of Paul Dryden finding two Codlings for 3 lb 12 oz. But alas this wasn't enough to win the match Rob Allison won with 7 Billets for 7 lb 02 oz. Fishing a small flooding tide, long distance N.E. swell in the water it was the best weigh of the season so far. Rob Allison continued his winning form with 4 fish for 12 lb 00 oz, Dennis Thompson hard on his heels with 4 fish for 10 lb 14 oz including a fine fish of 9 lb 03 oz the heaviest of the season so far. A low water match, calm conditions, results were better than expected. Denis Thompson continued to find the fish winning the match with two Codlings for 7 lb 04 oz, Brian Harland a close second with three fish for 6 lb 13 oz. Fishing an ebbing tide, flat calm, tough conditions to find fish. But not for Ben Laws who won the night with a cracking single cod of 10 lb 08 oz his personnel best and the heaviest fish of the Whitby Sea Anglers year so far. 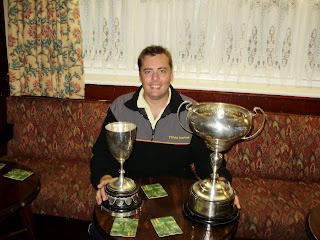 This years winner Mark Jackson with the Open match and heaviest fish trophies. Seventy six seniors and one junior took part in the shore event. 1st was Mark Jackson with a single fish of 5 lb 09 oz. 2nd place Rob Allison a single fish of 5 lb 01 oz. 3rd Paul Kilpatrick again a single fish of 2 lb 00 oz. Junior Winner was Ryan Vasey. In total only three senior and one junior anglers weighed in. The weigh in took place at the middle Fleece pub where hot food was served,the presentation and raffle took place.Many thanks to the landlord and his team for making us so welcome and supporting the event over the past years. 2nd Rob Allison 5 lb 01 oz. Fishing a small flooding tide strong s/w wind calm conditions only five anglers came back to the scales. Rob Allison won the match with three fish for 2 lb 14 oz. A low water match, Heavy N.E. swell running and torrential rain. Results were patchy but Paul Kilpatrick showed he hasn't lost his touch returning to the club after a short absence. He won the match with five fish for 17 lb 02 oz. 12th Dave Perrett 0 lb 06 oz 1 fish. Fishing an ebb tide to low water match light southerly movement and colour in the water things looked good for a decent weigh in. Most of the members came back to the scales with I think the best weigh in of the season so far. A few decent Codlings coming back to the scales the best from Rob Allison a fish of 7 lb 10 oz. The winning bag though went to Phil Mead with three fish for 10 lb 12 oz. Fishing a flooding tide flat calm conditions things weren’t looking to promising. But still a couple of Codlings came back to the scales including one of 6 lb 07 oz caught by Dave Perrett who also won the match with 2 fish for 7 lb 07 oz. A low water match, light Northerly motion in the water. A slight improvement in conditions to the last match and also an improvement in the catch, with sixteen anglers coming back to the scales. Phil Mead won the competition with three fish for 9 lb 03 oz. An ebb tide to low water match light to moderate N.E movement and colour in the water. Again reasonable conditions and again a few Codlings came back to the scales. Phil Mead continued his run of good form winning his second match in a row with two fish for 11 lb 13 oz. 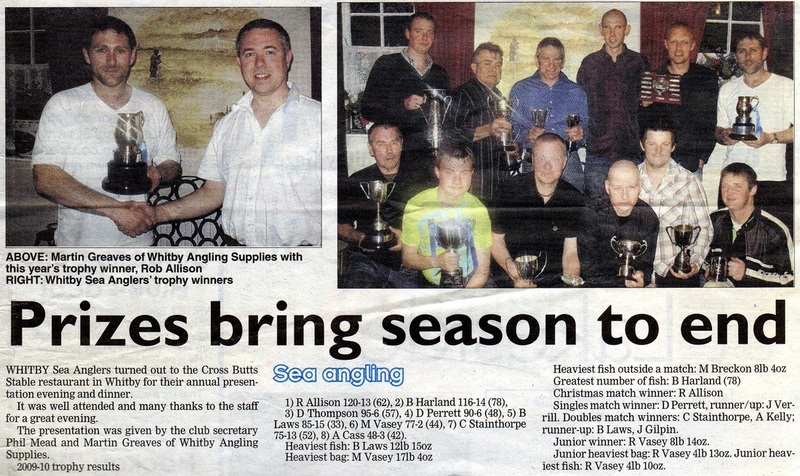 Whitby Sea Anglers turned out to fish there Annual Christmas Match. Fishing a flood tide to high water with a long distance swell in the water 13 anglers came back to the scales. This years winner was Rob Allison with 4 fish for 6 lb 12 oz, the winner of the heaviest fish was Dave Hambley with a fish of 4 lb 14 oz. The last match of 2009 and of the decade Whitby Sea Anglers turned out to fish a high water match with a light long distance swell in the water. Results slightly disappointing given there are a few fish about at the moment. James Verrill took the match with a single good cod of 7 lb 06 oz. 5th Colin Stainthorpe 0 lb 13 oz 1 fish. The first match of the New Year saw Whitby Sea Anglers facing freezing conditions and snow. With an ebb tide and swell in the water the weigh in wasn't too bad with a few codlings coming back to the scales. James Gilpin won the match with 3 fish for 8 lb 05 oz. Fishing a high water match, heavy seas and near arctic conditions only the odd Codling came back to the scales. Rob Allison won the match with a nice single Cod of 8 lb 07 oz. This was the annual Ship Inn Open incorporating the Whitby Gazette 1924 Trophy. The winner would be the captor of the heaviest single Cod. The event attracted 53 anglers who turned out to fish in cold conditions and near gale force Easterly winds. 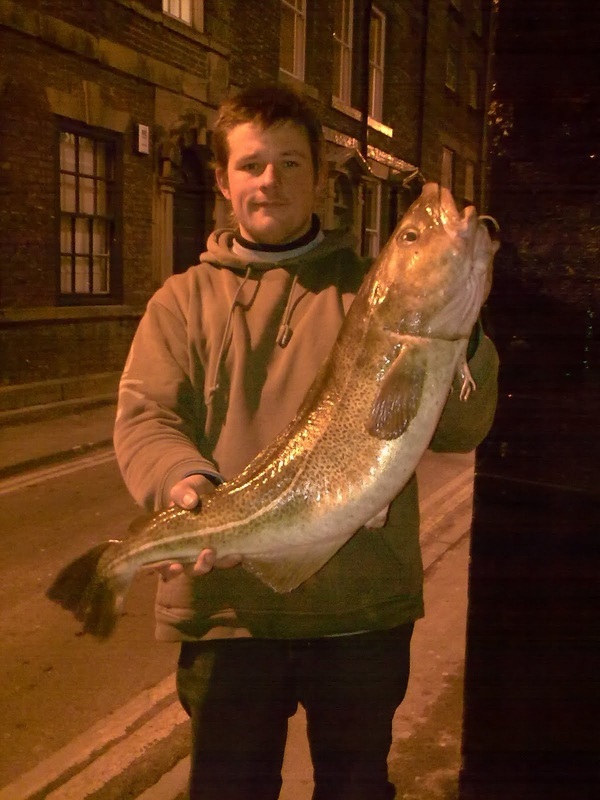 The competition was won with a single fish of 12 lb 15 oz caught by Whitby Sea Angler Ben laws. Sadly only another three anglers weighed in. Thanks go out the main sponsors Glenn Stocks and Matt & Mel from The Ship Inn. Ben Laws with the winning fish of 12 lb 15 oz, Photo below. Heaviest Bag Ben Laws 12 lb 15 oz. Fishing a low water match heavy easterly movement not much colour in the water most anglers struggled to find the fish. Except Mike Vasey who had three fish for 17 lb 04 oz including a fish of 12 lb 12 oz this is also the heaviest bag of the season so far. Mike with the 12 lb 12 oz cod. A low water match with a good easterly movement but lacked colour in the water this proved for disappointing results. The winner though was Colin Stainthorpe with three fish for 5 lb 09 oz. When the winds in the East the fish bite least so they say and it proved right as results were poor again. Colin Stainthorpe took his second match in a row with a fish of 5 lb 04 oz. Fishing a flood tide to high water with a long distance swell in the water. Only three anglers came back to the scales. The man in form at the moment Colin Stainthorpe getting his hat trick with his third win in a row. Fishing a low water match and a growing sea results were very disappointing. Only three anglers came back to the scales all with Rocklings. Fishing a large ebbing tide a good Northerly swell and colour in the water results were a lot better than the previous match. Mike Vasey won with a dead on ten pound bag of three fish including one of 6 lb 10 oz. A high water ebb match with a decent sea running and colour. One or two codlings came back to the scales. Dave Perrett won the match with three Codlings for 12 lb 05 oz. A flood tide with a light N.E. movement found anglers struggling to find fish only three came back to the scales. Dave Hambley won the match with a single fish of 3 lb 07 oz. Whitby Sea Anglers turned out to fish the Annual Bell Trophy. This is an interclub event between clubs from Whitby, Scarborough, Filey and Bridlington. The winner is the club with the heaviest average weight between its entrants. This year 64 anglers took part and sadly as is the norm this year when conditions are not ideal there is not much caught alas only three anglers from all the teams weighed in. I'm pleased to say that the Whitby Sea Anglers won the event with Andy Cass catching a single Codling of 2 lb 12 oz. Another poor result only two anglers came back to the scales. Again Andy Cass won with a single fish of 1 lb 09 oz. Another disappointing result only two anglers back at the scales. Colin Stainthorpe won with a single fish of 3 lb 02 oz. With a good sea running hopes were high for a good weigh in but again poor results only four anglers came back to the scales and only three with Codlings. Colin Stainthorpe took the match with two fish for 5 lb 02 oz. Fishing an ebb tide and good sea conditions only one angler came back to the scales. It seems this season even with good sea conditions the fishing has been very poor compared to previous years. Dave Perrett won the match with a single Codling of 2 lb 07 oz. Fishing reasonable conditions an odd Codling came back to the scales. Brain Harland got back to winning ways to win the match with 2 fish for 5 lb 14 oz. Fishing the flood tide to high water two anglers at last managed to find a few fish. Rob Allison and Dennis Thompson being the men of the moment. It was Rob Allison however who won the match with 6 fish for 9 lb 09 oz. A low water flood match with decent sea running. Only three anglers came back to the scales Mike Vasey winning the match with 2 fish for 3 lb 01 oz. Fishing ebb tide to low water. Brian Harland managed to find a few fish winning the match with 3 fish for 8 lb 05 oz, Ben Laws also found a single better fish of 6 lb 05 oz the heaviest of the month so far. Fishing calmer conditions results were down, Dennis Thompson took the match with two fish for 3 lb 11 oz. With the end of the season fast approaching results were again poor. Dave Perrett won with a single fish of 2 lb 12 oz. Only two anglers weighed in. Rob Allison won with two fish for 4 lb 03 oz. Fishing the penultimate match of the season the top and mid positions could easily change given good conditions. But alas this didn't happen but Peter Horbury sneaked out a good fish of 7 lb 14 oz to take the match and heaviest fish of the month. The last match of the season saw a late challenge for the top spot by Brian Harland winning the match with three fish for 9 lb 14 oz but alas this was not quite enough to beat R. Allison who successfully defended his title. So congratulations to Rob for winning the 2009 - 2010 season. April 24th end of season dinner and presentation. Whitby Sea Anglers turned out to the Cross Butts Stable restaurant for there annual presentation evening and dinner. It was well attended and many thanks go to the staff for a great evening. The presentation was given by the club secretary Phil Mead and Martin Greaves of Whitby Angling Supplies. Brian Harland - 14 lb 00 oz - 9 fish. Rob Allison - 12 lb 00 oz - 4 fish. Courtesy of the Whitby Gazette.